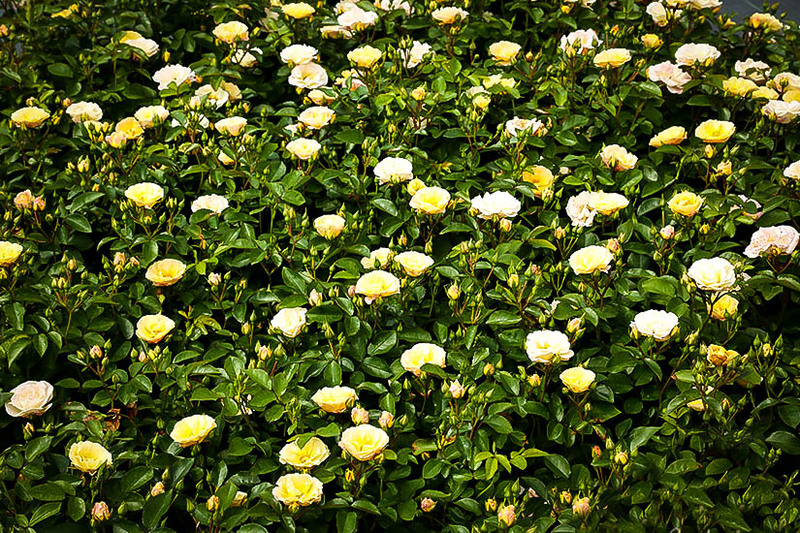 The Popcorn Drift® Rose will bring sparkle and joy to your garden, with its bright yellow and white blooms. A bush in bloom – and they never stop blooming – looks like a bowl of fresh, buttered popcorn has landed in the garden, and everyone, children too, will enjoy its beauty. The flowers are bright yellow, with a white center, and sweetly scented. 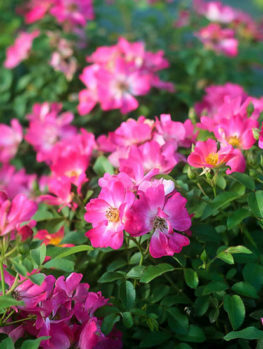 This low-growing rose forms an attractive mound of foliage between 2 and 3 feet across, but only 18 inches tall. It is perfect for the front of your beds, for edging a walkway, or for planting at the top of a wall to soften the harsh lines. It is also small enough to grow in larger planters and containers, replacing annual flowers that constantly need changing. 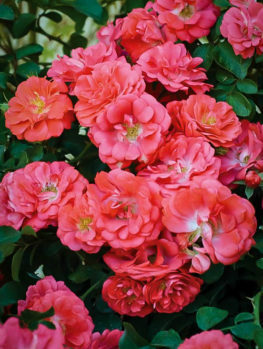 Wherever you grow this rose you will love how it brings light and joy to your garden. The best location for the Popcorn Drift Rose is in full sun, as this will keep it blooming constantly. This plant grows well in all kinds of soil, even clays, but it will not grow as well in very dry, sandy soil, or in soil that is constantly wet. What makes these Drift Roses so special is their resistance to diseases, so that spraying and fussing are a thing of the past. Think of them as flowering shrubs, not fussy roses, because they will work in your garden in that way, bringing flower color from early summer to late fall, and even in winter in very mild areas. Bright color from flowering shrubs is the essence of a garden. After all the hedges and foundation planting goes in, we need plenty of color to bring the garden alive. Unfortunately, most flowering shrubs last just a short time, perhaps two weeks typically, and then it is green leaves for the rest of the year. But there are some shrubs that flower continuously from early summer to the frost, and these deserve a prized place in every garden. 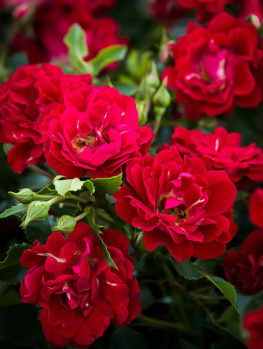 With the development of new varieties, roses – once difficult and needed lots of care – have come out as a number one choice for continuous flowering shrubs. 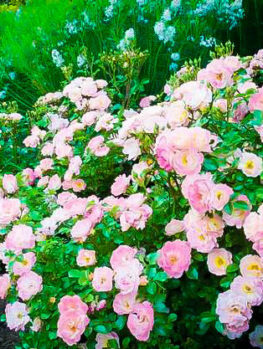 Among the best of these newer roses are the Drift Roses, which are low-growing, compact, slightly trailing mounds of continuous flowers. One stands out for its unusual coloring, and that is the Popcorn Drift Rose. As the name suggests, this plant looks like a bowl of buttered popcorn, with its yellow flowers opening to show sparkling white centers. This is a truly outstanding garden plant, free of diseases and flowering continuously. 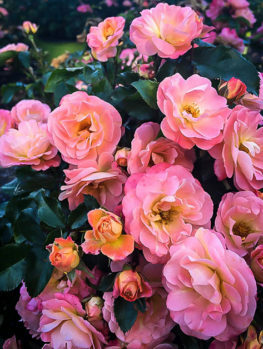 The Popcorn Drift Rose is a low shrub, 18 inches tall and about 30 inches across, growing in a slightly trailing mound, with upright clusters of flowers. The flowers are small, about 2 inches across, but they are carried in such profusion that the leaves are hidden by them. From early summer to frost, new clusters of 5 to 8 flowers appear all across the plant, new ones arising before the older ones have even faded away. There is continuous bloom all season long, and what attractive bloom it is! The flowers are bright yellow, with over 20 petals in each fully-double flower. As the flowers open, the center shows white, so with the mixture of flowers at different stages, the whole plant is a mix of yellow and white – exactly like a bowl of buttered popcorn. Bury your nose in a flower and you won’t smell popcorn, but you will smell the sweetest floral fragrance, adding an extra layer to your appreciation of this plant. The foliage of the Popcorn Drift Rose is rich-green and glossy, and unlike so many roses it is always free of the blemishes of Black Spot, Powdery Mildew or Rust. The leaves stay healthy and green, not yellow or dusty, because the breeders of this plant took great trouble to make it so. 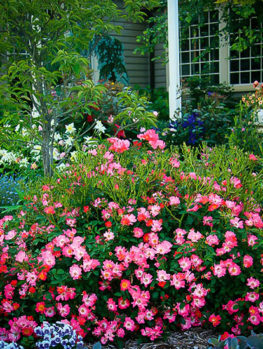 Because of its smaller size, this is the perfect shrub for the front of a garden bed, or for planting in small spaces. It looks beautiful planted at the top of a wall, where it will fall down slightly and soften those harsh edges of stone and brick. Plant it along a walkway, or in a narrow space. 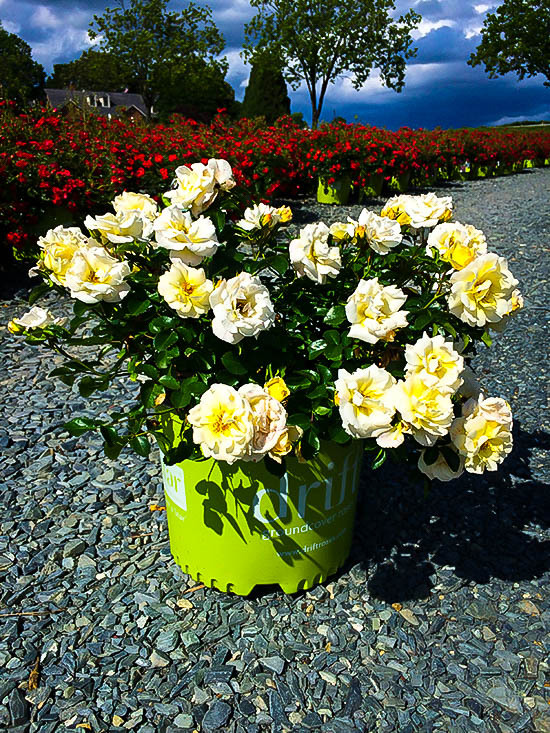 It is also a great choice for containers, planters and boxes, so even if you don’t have a garden you can grow the Popcorn Drift Rose. It will flower as continuously as most annual flowers, and keep coming back year after year. 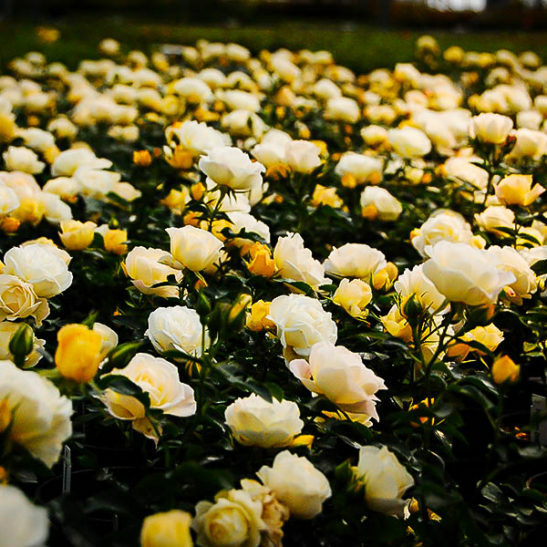 You can plant your Popcorn Drift Rose in most kinds of soil, and they like clay, if it is not constantly wet. Very poor, dry soils will not produce the best growth. Blend plenty of rich organic material into the soil when you prepare it for planting, and choose a spot that is in the sun all day. 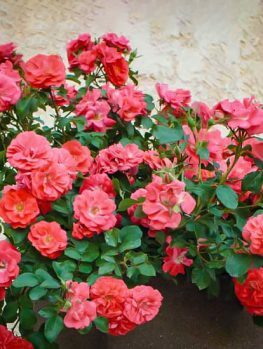 Water well, especially during the first year, and use a rose fertilizer regularly to get the best and healthiest growth from your plants. In early spring trim your bushes, removing any weak branches, old flower shoots, and shortening the main branches back by a few inches to a bud. That is all the care they need – just one small job once a year. The Popcorn Drift Rose is the result of modern plant breeding techniques. It began with another beautiful rose available here at the Tree Center – the gorgeous Peach Drift Rose, which is the result of a detailed breeding program by the famous French rose-breeding family, Meilland. 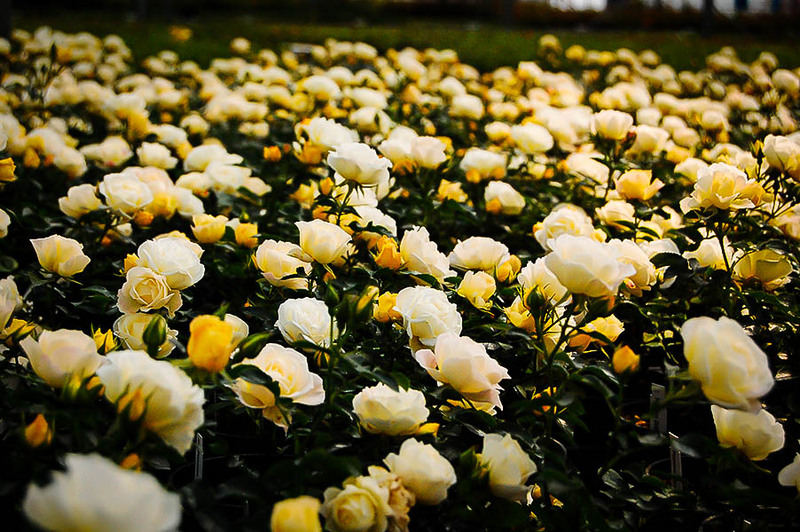 That rose was introduced to America by Star Roses, a prestigious US nursery. They in turn used the most advanced laboratory techniques to encourage the rose to produce new, novel genes, and grew the resulting plants to see how well they performed. One stood out, for its remarkable flower coloring, and continuous blooming. When tested, it was also very resistant to diseases. That plant is the Popcorn Drift Rose. This remarkable plant, with its iconic American image of popcorn, is sure to become a big hit across the country. Its ease of growth will make it an instant favorite. Although we have a good stock of these plants, we do not expect them to be with us long, so order soon! 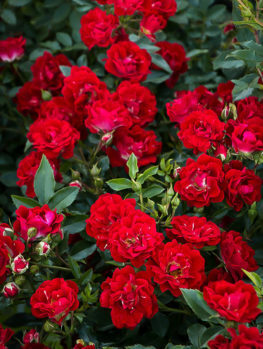 If you like this plant, make sure to browse similar varieties like the Pink Drift Rose and the Red Drift Rose.